Last week, I bought a hat. For the record, I do not normally buy hats, nor do I normally shop in the kind of fancy one-of-a-kind SoHo boutiques in New York City where I bought this one. But my friend Carmen was visiting from Spain—her first trip to the United States—and saw the interesting collection of fabrics in the window and became curious. “Shall we go in?” Carmen asked me in French, since she speaks no English, and my French is far better than my Spanish is. “I’m actually a little afraid of this store,” I replied, sensing something indescribable, but heading up the step into the store anyway, figuring we would probably have a quick look and turn right back around, since either the clothing would be strange or the prices way too high, since this was, indeed, located in SoHo. As another customer departed, a very petite woman with bright blue painted eyebrows greeted us. As we began to look at the beautiful items, she asked us not if we needed help but what language we were speaking and where we were from. I explained in English that I was a native New Yorker, but that Carmen was from the north of Spain, and spoke Spanish and French. And Italian, it turns out, as our host turned out to be from Milan and began to speak to Carmen in Italian, telling Carmen that she seemed more Parisian than Spanish because of her coloring and carriage. 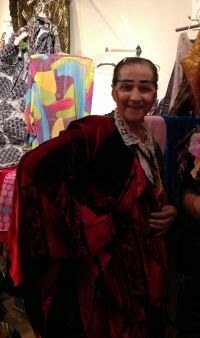 Soon, this tiny woman who bears a striking resemblance to Coco Chanel in her later years began to tell us all about herself, her connections to the fashion world and the history of fashion, about knowing Basquiat and Salvador Dali when Dali lived just down the block, quoting the poetry of Rimbaud. In the meantime, she gave Carmen a coat to try on. The black-and-white herringbone coat was in the style of Jackie Kennedy meets Audrey Hepburn. I literally got chills—I kept searching for the French word “frissons”—when Carmen tried it on. A perfect fit, in size, style, and color. We heard more stories, as this woman—whose name we discovered was Luxor Tavella—brought her more and more absolutely perfect items to try, items she could easily find among the mélange of fabrics and textures and hangars and racks. And each one seemed more beautiful. Soon, I guess she decided that I had been standing around watching long enough and she brought me this exquisite purple (my favorite color) fake fur hat for winter. At once looking a little Russian and a little Parisian, she urged me to try it. I did. Never had a hat fit me so well or looked so good. Luxor suggested that since the hat is in more of doughnut shape (my words, not hers), I could also wear it around my neck. She showed me how. As we looked into the mirror, Luxor spoke of how the hat made my skin look luminous, how my eyes shone with it on, how my whole face softened and glowed. But I don’t wear hats, or spending money on hats, or shopping like this generally. How could I emotionally and financially justify this expenditure–$40—but in some ways it could have been $1 million. Each time I thought about saying no, or coming back another time, however, I thought about her words—about how she made me feel saying these lovely things about me. I was not just buying a hat, which I could use anyway, since it does get cold here in winter, and I never remember to cover my head. I was buying a whole experience. After two hours of conversation and trying on clothes and playing dress-up, Luxor and I brought the hat to the counter where I paid for it. Carmen was still not sure about spending the money on the coat. Luxor told her, partly in French, Italian, and English, that if she did not buy it, it would not be a problem, and that “we would still be friends.” Carmen bought the coat, as well as a sunhat, worthy of Grace Kelly on the beach at Cannes in To Catch a Thief. Before we left, Luxor wanted us to take pictures with her. For these pictures, she gave us more clothes to drape around ourselves for the camera, and gave me a bouquet of silk flowers. She asked us to bring the images back to her and told her me to remind her of our discussion of “frissons” and its translation into four different languages if she did not recognize us right away. Merleau-Ponty tells us that we are not just beings but rather beings in a human body—embodied Beings-in-the-World. Thus, the way we choose to accouter ourselves speaks to our Being-in-the-World. Luxor’s store is called Paracelso, named after Paracelsus, the 15th century physician, astrologer, and alchemist. Alchemy, literally the art and magic of turning lead into gold, underlies what happens when you enter Luxor’s store. In true creativity, May (1975) speaks of the importance of encounter—the “engagement with reality” (p. 43) that happens when the artist uses his or her talent and interacts with the world. In many stores, the common refrain heard upon entering is “How may I help you?” In Paracelso, what Carmen and I heard were variations on the theme of “How may I get to know you so that we may, together, create a look and a feeling that brings out who you really are?” This is a much more interrelational way of engaging with a customer, who becomes not just a line on a ledger sheet, but a real person. Luxor describes what she does—and she has been in business for more than 40 years—as art. She picks pieces she likes and brings them to her store. Like a matchmaker, she finds the right piece of clothing for its rightful owner. Her work, she says, comes from the soul, as she reunites lost lovers—person and fabric, Being and its softest, most luxurious and fashionable World. Not only do I have a new hat but also a new friendship. Who can put a price on that?